Having enjoyed a strong two weeks, the GBP/EUR exchange rate is now at risk of giving back some gains we are told. Financial traders have placed more bets that the British currency will rise in value during the last week than at any other time in the last three and a half years, according to Chicago Futures Trading Commission data. This news is just the latest in a trend of improving sentiment towards Sterling that has seen global FX markets turn from being net sellers of Sterling, to net buyers. The shift in sentiment offers one explanation as to why the Pound-to-Euro exchange rate has now fallen back from the highs it saw Thursday. Last week's CFTC Commitments of Traders report showed speculators holding their largest positive bet on the Pound since July 2014, reversing what was a record bearish bet against the British currency just six months ago. The data comes at a time when the Pound is riding high against its international rivals, after having risen by 4.6% against the US Dollar in January and by 1.29% against the Euro. 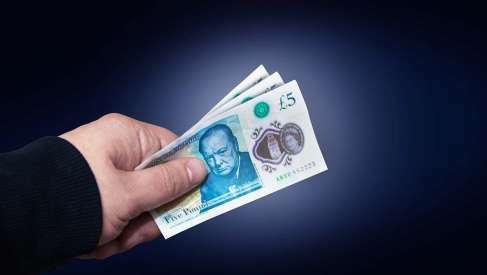 This performance has been aided by better economic data and a new sense of calm in markets over the trajectory of the Brexit negotiations, but it has also left the British currency at risk of falling victim to its own recent success. “The Brexit risk premium has declined substantially in recent weeks and while we still expect EUR/GBP to break lower eventually on Brexit clarification, it is still very early days of the second round of Brexit talks,” says Mathias Røn Mogensen, an analyst at Danske Bank. Mogensen says the extreme positioning shift of the last week, while explaining the sharp rise in the Pound-to-Euro rate over the last seven days, could now prove a headwind to further gains for Sterling in the short term. Positioning matters because when markets have bet heavily on a currency, favouring a move in one direction or another, other traders may hold off from doing the same in order to avoid being caught on the wrong side of a sudden change in sentiment. This can lead to a dearth of new bids in the market that then sees the exchange rate stall. It can also leave the exchange rate vulnerable to a sudden reversal in the event that traders take profits off of the table by closing some of their positions. “We still see risks skewed to the upside near-term amid stretched short-term valuation and positioning,” Mogensen writes of the EUR/GBP in a note Monday, suggesting the Pound-to-Euro rate may be vulnerable to a fall in the short term. Above: Pound-to-Euro rate shown at two hour intervals. Captures rise during January. Danske Bank’s own short-term valuation model suggests that the EUR/GBP rate is oversold, which is the same as saying the Pound-to-Euro rate has been overbought, and that a fair value for the EUR/GBP exchange rate is 0.8999. A 0.8999 EUR/GBP rate puts the Pound-to-Euro rate at 1.1112, which is some way below Monday’s level of around 1.1389. Not everybody sees curent positioning as a barrier to new highs for the Pound however, although these voices are in the minority. "Investors may be near the longest they’ve been in GBP for the last five years, but that’s only because they’ve been mostly short the currency for that time," says Marshall Gittler, chief strategist at ACLS Global, suggesting that all we have really seen is a bailing out of negative bets rather than a surge of positive bets on the Pound. "They’ve had much much bigger short positions during that time, and going back further, they’ve had long positions more than double what they currently hold. So positioning is no obstacle to a higher GBP," adds Gittler. With weakness of the US Dollar set aside, there have been two catalysts behind recent upward moves in Sterling. First and foremost, the economy has continued to motor along at a steady pace in recent months, with recent ONS data showing 2017 economic growth coming in at 1.8%, a minor 10 basis points slower than in the prior year. Steady growth and a tight labour market have both helped bolster expectations that wage pressures will rise further during the year ahead, which has kept hopes of another Bank of England interest rate rise alive and well. Second has been a flurry of signs that the UK might be headed toward a more benign form of Brexit than markets had originally feared. This could be one that leaves many of the features of EU membership still in place, but just sat under a different name tag, making for a so called “Brexit in Name Only”. Above: Pound-to-Euro rate shown at weekly intervals. Captures referendum collapse and recent trading. “Sterling has performed very well and mounting expectations of the next rate hike coming sooner than later are helping. But as those longs build, EUR/GBP 0.87 is holding,” says Kit Juckes, chief FX strategist at Societe Generale. For how long the mood around Sterling remains as optimistic as it has been of late still remains to be seen. The European Commission is expected to release its guidelines for negotiators of Brexit transition arrangements on Monday. Talks covering the process of moving from membership to the future relationship get underway this week and are expected to run until March. After March, the difficult part begins in earnest, when talks around the future trading relationship begin. Negotiators will have around six months to put together an agreement if it is to be approved by the European Council and ratified in all parliaments across the European Union before the March 29, 2019 exit day. With the clock ticking the entire time, this leaves plenty of scope for another shift in sentiment toward the Pound Sterling. Societe Generale’s Juckes says traders might not have to wait very long at all before the Pound takes another southward turn. “I want to get short GBP on a failed test of EUR/GBP 0.85, but I wonder if we'll even get that far?”, the strategist wrote in a note Monday. EUR/GBP at 0.85 gives us a GBP/EUR exchange rate at 1.1764.